Do your old floors need some renovating? 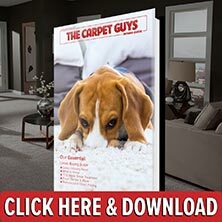 Book a free carpet installation estimate with The Carpet Guys today. Over thirty years of experience has shown us what homeowners are looking for. You want the best carpet products available at a fair price. In our warehouse, our shelves are stocked with the best brand name carpeting available, and the prices are fair and affordable. We believe that everyone should have the opportunity to experience the joys of new carpet from a professional company. People who look for carpet with free installation typically wind up with poor workmanship and cheap materials. Do yourself a favor and get the best carpet deals from the most experienced carpet installers in Southgate. Don’t waste your time with fly-by-night carpet installers who seem to know what they are doing. Get a free estimate set up with us and receive the professional service you deserve. Plush Carpet – If you enjoy a more formal and sophisticated home design, then Plush is the perfect style for you. It has a rich and luxurious velvet-like feel that is sure to please. Frieze Carpet – Looking for a more casual and informal home design? Have our Frieze carpet installed in your rooms. It offers a definite flair that all your visitors will notice. Berber Carpet – For any home that experiences a lot of foot traffic and abuse, Berber is the best fit. It is durable, wears well, and hides dirt intrusion almost completely. Looped Carpet – To get a style of carpeting that adds some extra interest underfoot, explore our variety of Looped carpet. It comes in all kinds of colors and will fit well in your home. We are ready to give you the new carpet you have been waiting for, so get your free estimate scheduled today!